GUARDING THE MOUTH OF the Singapore River, the statue of the Merlion -- a sea-creature of dubious mythological pedigree -- is one of the island's best-known landmarks. Unfortunately, more and more residents are unable make out its finer features. The reason has nothing to do with the haze from Indonesian forest fires, the corrosive action of acid rain or even the glare of the tropical sun. 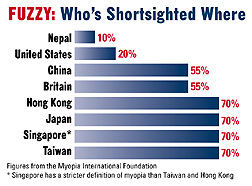 Rather, it is because Singapore suffers from one of the highest rates of myopia, or shortsightedness, in the world. More than half the Lion City's 12-year-olds need corrective lenses. And among some groups of college students, the proportion jumps to as much as 80%. "These days, it's not unusual to see three-year-old children with glasses," says Dr. Uma Rajan, director of school health services for the Ministry of Health. "It's causing us great concern." And the problem is deteriorating rapidly, researchers say. In the mid-1980s, roughly 30% of recruits in the Singapore Armed Forces were shortsighted. By 1993, the figure had doubled to 62%. "There has been a dramatic increase over the past 10 years," says Dr. Chew Sek Jin, director of the National Eye Center. "It's worsening very quickly." The surge in myopia is a worldwide phenomenon and continues to baffle scientists. There is a genetic component; shortsightedness is typically more common among Chinese than other races. But recent studies suggest that environmental factors may be to blame. The prime suspect: "near-work." This is the highly concentrated vision used for reading, writing or staring at television screens, when the object is less than 40 centimeters away. Prolonged near-work, especially at night, makes the eyeball lengthen. This causes vision to soften into a blur as the images of distant objects are focused at a point in front of the retina rather than on it. Experts in Singapore suspect that the city's notoriously hardworking students may be cramming their way to myopia. Local data show that 9-year-olds spend about four to five hours on near-work each day. That's excluding time in the classroom. The period devoted to outdoor activities, which are thought to help stave off shortsightedness? Less than 30 minutes. Allied with the island's compact urban environment -- huge expanses of open space are rare -- and you get an unhealthy "visual lifestyle," says the health ministry's Rajan. Singapore planners have embarked on a multi-pronged campaign to slow the trend. One thrust takes the form of special eye exercises for primary school students -- all pupils must engage in five minutes of orbital pressure-point massage every day. It is too early to tell if the program is effective against myopia, but the children say their eyes feel more relaxed. Educators are putting more lights in classrooms, asking textbook publishers to use larger print, and even encouraging teachers to scrawl more legibly on blackboards. Earlier, health officials organized an exhibition aimed at debunking myths about myopia and discouraging bad habits such as doing near-work into the night. "The point is to try to come up with behavioral change," says Chew. "But you can't tell the child not to read -- we cannot go back to the dark ages." Widespread nearsightedness is also posing a challenge for the armed forces (all able-bodied males are required to perform at least two years' national service). Bespectacled soldiers may have trouble training the sights of their guns, or retaining contact lenses in the heat and dust of battle. Sea-spray could make it impossible for sailors to see through their glasses. Already, eyesight standards are being relaxed for airforce pilots. "We are very concerned about the increase [of myopia]," says Colonel Lionel Lee, chief of the armed forces' Medical Corps. As it is, he anticipates that soon 70% of recruits will have defective vision. The military brass has convened a team of experts to look into possible remedies, ranging from hardy corrective goggles to improved contact lenses and elective surgery for specialists. More help is on its way. A team from the Ngee Ann Polytechnic recently developed a gadget to curb students' habit of burying their heads in books. The device, which is clipped to a reader's glasses, buzzes when a book is brought too close to the face. A small measure, perhaps, but it may just help Singapore children keep the Merlion in focus.